7th Ave in Chelsea and in the West Village is always busy with cars, bicyclists and pedestrians including children who are attending PS 41 on Grenwich Ave. 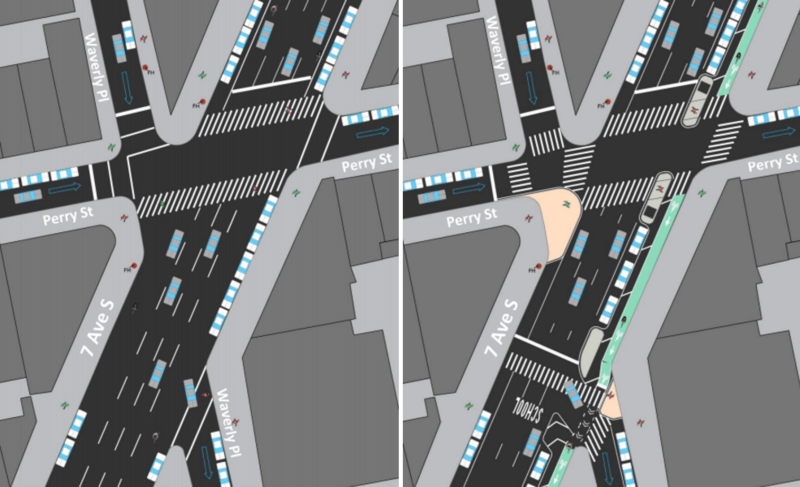 It was flagged as a Vision Zero Priority Corridor after statistics showed that, between 2011 and 2015, 175 pedestrians, 96 cyclists and 239 motor vehicle passengers suffered personal injury in traffic accidents on Seventh Ave between 30th Street and Clarkson Street. Additional studies showed that the Avenue had a high bicycle volume despite not having a bike lane. In 2016 over a 14-hour count, 1,700 cyclists were recorded at West 30th Street, 2,350 at West 20th Street and 1,300 at Charles Street. Parents and staff at PS41 who have been fighting for additional safety measures on Seventh Ave are finally getting what they have been asking for over the last 5 years.